You are at:Home»APPS»Best IM? Hangouts, WhatsApp or Viber. Whether you use Google’s Hangouts, Facebook’s WhatsApp, or Viber, they all share a great UI, free communication to app users, accessibility on all mobile devices, they’re free, and thank the lord, they all work on Wi-Fi. Google’s Hangouts has been a long time choice for me. Now that I think about it, today may be a one-year anniversary for us. Should I buy it a gift? Anyways, here is what I think about hangouts. 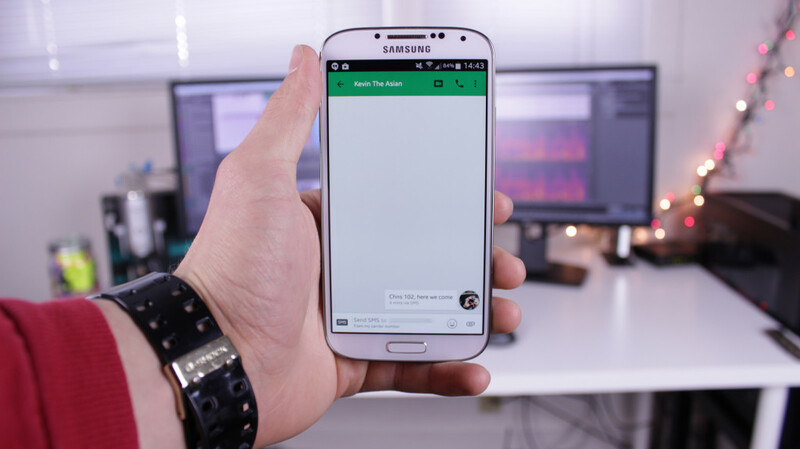 Hangouts is the only app of the three to be able to go from calling other Hangout users for free to calling anyone in your contacts. WhatsApp and Viber only provide communication to other WhatsApp or Viber users. You’d think Google could have fixed this or included it from the start, but Hangouts can only send one image or media file at a time. Therefore, if you want to send multiple pictures to a family member or friend, you have to send them individually. There is no quick way to send multiple pictures to anyone through Hangouts. WhatsApp was completely new to me when I started this match up. I have to say right off the bat I was excited. The user interface (UI) was a lot different than Hangouts and overall it was more sophisticated. It was easy to find what I loved with WhatsApp. Its UI is fantastic. I didn’t see a single bad review about its UI. The UI was smooth, easy to navigate, and easy on the eyes. I’m not a big fan of emoticons, but if my girlfriend saw them, she’d go nuts. WhatsApp is littered with emoticons. Go emoticons..! What is the point of downloading a messaging app to only speak to people who’ve downloaded the same app? I want to be able to talk to anyone on my contacts through one single app while being able to message and call the few that have WhatsApp for free every now and then. However, it was raised to my attention and was sort of hidden in my YouTube video in a text scene. 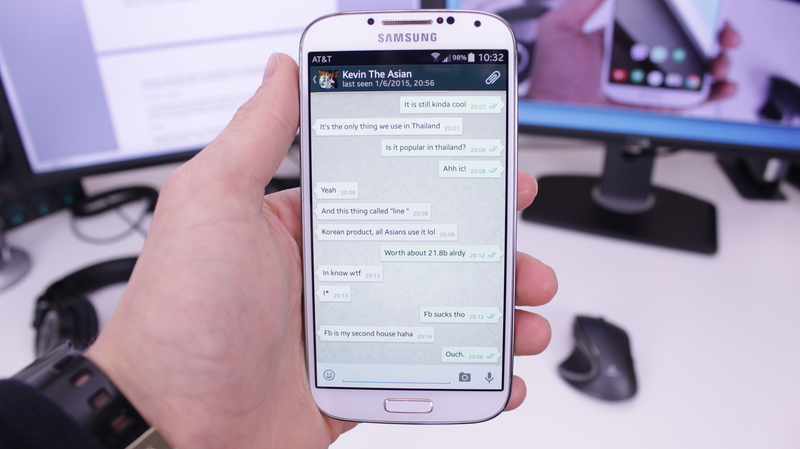 WhatsApp is the primary messaging app in other countries, such as Thailand. It sips at data instead of using SMS, because foreign service providers do not always offer unlimited SMS. I understand this, but I live in good ole’ America. 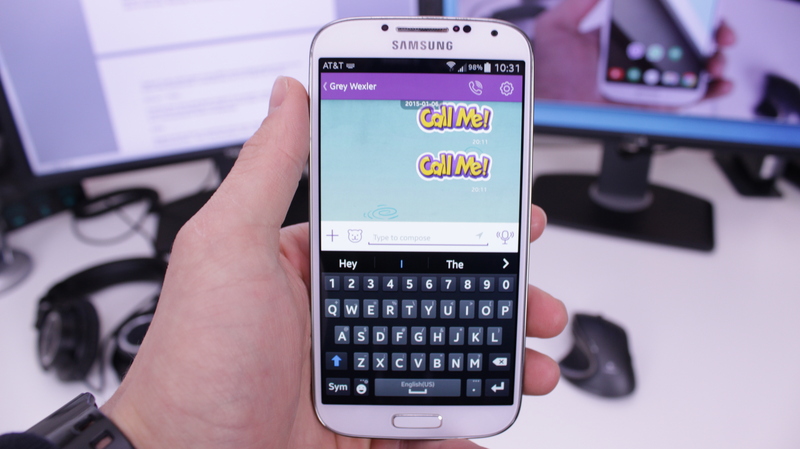 Until Max from Asian Geek Squad brought it to my attention, I had never heard of Viber. It wasn’t that it was unpopular; it was just I have been happy with Hangouts so long that I never went searching for another messaging app. Hangouts has the ability to communicate with anyone; WhatsApp has the best UI among the three; and Viber… Well, Viber has stickers. That’s right. Viber was the first to incorporate a much more graphical emoticon, if you wish. You can download a ton of free or purchase additional stickers. However, this process is a little annoying at times. Viber is identical to WhatsApp in terms of what I hate the most. However, if you are out of the United States, then this is very strong competitor. Viber is a great app, but not in the United States. Ok, so I have given you a quick rundown of the three very popular messaging apps. It is now your choice to pick. I, personally, recommend Hangouts if you are in the United States. It may not have a ton of emoticons or any stickers at all, but it is very reliable and can be used to message or call anyone. If you are located in a country East of the United States, such as Thailand, then don’t hesitate and download WhatsApp. It will be the best option for you. Well guys, its been fun! If you have any questions at all, leave a comment and I will get back to you or subscribe to me on YouTube! Thanks!